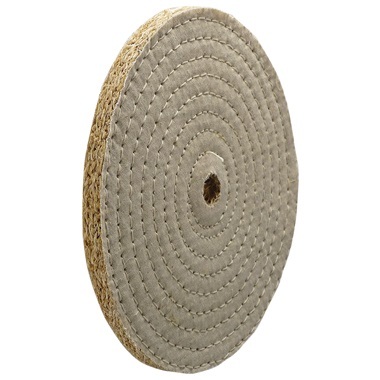 Natural-woven sisal fiber with unbleached cotton covers is 3/8" spiral-sewn together for extra stiffness. Sisal material creates extremely aggressive cutting action when used with Emery compound. Use for deep scratch removal on stainless, iron, steel, and aluminum. Made in USA. Sisal wheels wear more rapidly than cotton-material wheels. 6" wheel diameter. Fits 1/2"-5/8" arbor hole. For 1/3 HP buffer. 1/2" thick, 30-ply. Made in USA. 8" wheel diameter. Fits 3/4"-7/8" arbor hole. For 3/4 and 1-1/2 HP buffer. 1/2" thick, 30-ply. Made in USA. 10" wheel diameter. Fits 3/4"-7/8" arbor hole. For 3/4 and 1-1/2 HP buffer. 1/2" thick, 30-ply. Made in USA. I do some hobby buffing of car parts.